GeoTeric is closing the loop with a succession of updates this year that will simplify and shorten your whole interpretation workflow. The latest release, 2017.1 redefines horizon interpretation and simplifies well correlation and seismic to well ties. Adaptive Horizons with Regional Structural Awareness create the fastest and most accurate 3D seismic interpretation. Using Graph Theory to analyse the entire line, the Adaptive Horizons give you previews of all the available routes through the data and minimises the amount of manual interpretation required from the interpreter. Other unique features such as “Complete Line” and “Accept Tracked Line” enable the horizon to be quickly QC’d and completed, saving time and aiding efficiency, whilst maintaining the accuracy of the interpretation. In addition, any attribute or blend can be data mapped onto a horizon prior to surface generation, to identify mis-picks and correct them in the 3D or 2D windows. Well Correlation panel and Seismic to Well Ties extend the geological workflows in GeoTeric. 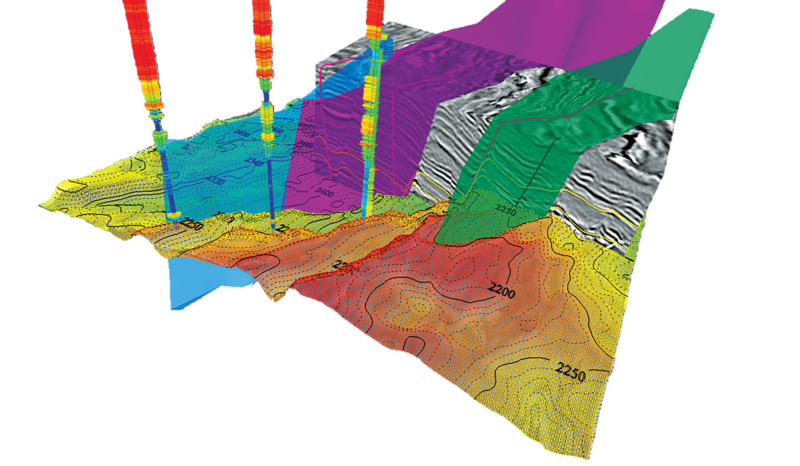 Multiple well logs can be viewed and interpreted easily with the ability to assign markers and lithologies and perform multi-well correlations. Synchronised with the 3D view, the well correlation integrates with your GeoTeric workflow as well as outputting scaled plots for effective cross team communication. The simple but effective seismic to well tie functionality ensures that your log data is correctly positioned and gives greater confidence in GeoTeric’s well based classification and log vs attribute scatter-plotting. What's Coming Later in 2017? Adaptive Faults complete the unified Adaptive Interpretation System, enabling faults to be extracted from the data in a semi-automated manner. Quick and easy to use with the same controls, the Adaptive Horizons and Adaptive Faults create a sealed interpretation framework, the basis of your structural model. Grid-less Models are created directly from the structural interpretation and GeoTeric’s facies classification volumes. Fully data-driven and capturing all the detail that is present in the data, the grid-less model gives you the most detailed and accurate static model possible. Validate your model by converting to synthetic seismic and correlating back to the original data. GeoTeric’s new Validate module enables you to QC the accuracy of your 3D structural model by closing the loop and correlating the synthetic seismic with the original data. It allows you to validate the model while interpreting to ensure an accurate representation of the underlying geology, without the need to construct a geo-cellular grid. To find out more about our offering please view this short overview video and see our two most recent blogs talking about the latest release and a more in-depth look at the new Adaptive Horizons.